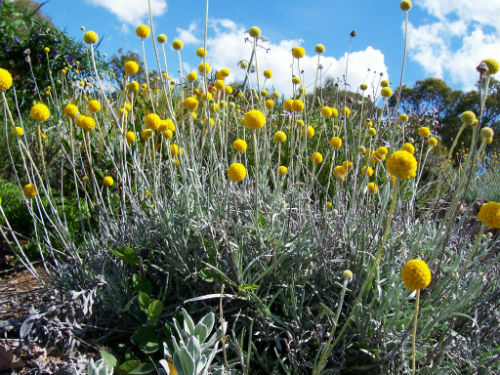 Pycnosorus globosus, Billy Buttons, a member of the Asteraceae (Daisy) family, is a dense ground cover with a spread of at least 50 centimetres. Soft leaves are grey, long and narrow. Golden globular flower heads are carried above the foliage on long stems. A large number of flowers appear in spring and summer. Mature plants may carry dozens of flower heads. The foliage provides a background to the flowers. Remove spent flowers to encourage more blooms. A Billy Buttons in full flower is a sight to behold in the garden. Flowers may be use in dry flower arrangements. Billy Buttons would be at home in cottage gardens, rockeries or as a foreground plant in native gardens. P. globosus has a wide distributed and occurs over much of NSW as well as Queensland, Victoria and South Australia. The species was previously known as Craspedia globosa and was renamed in 1992. The genus name is from the Greek, pycne, thick and sorus, heap; referring to the dense flower heads. The species name refers to the shape of the flower heads. Propagate from cuttings. As with most of this family cuttings produce roots rapidly.